Advantages: Excellent historical coverage, section dedicated to modelling the subject. Probably the first modern Soviet fighter encountered by Western Air Forces, the MiG-15 proved to be a worthy equal to the F-86 Sabre in the skies over North Korea, not to mention streets ahead of the Meteors, Mustangs and Sea Fury’s flown by Commonwealth Forces. A product of Soviet exploitation of German and British technology, applied in a uniquely Russian way (the early production aircraft suffered a wing-drop problem at high speed due to inability of the factories to produce identical left and right wing sets), the MiG-15 saw widespread service with client states around the world when the demands of Korea eased. 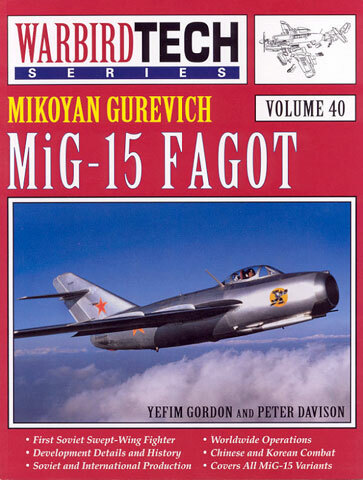 In Volume 40 of the Specialty Press Warbird Tech Series Yefim Gordon, working with Peter Davison, has produced yet another work which adds another dimension to the published history of the MiG-15. Given that this volume has been written by Gordon, who is a regular contributor to the Red Star Series and Aerofax imprints of Midland Counties, it comes as no surprise to find the chapters broken down in a similar way. The first four cover design and production, including that in Poland, Czechoslovakia and China. Then follows a chapter on operators. This is useful for modellers as Gordon includes contemporary photographs of the type in service and often comments on the camouflage and markings development of the respective users. After this is an examination of the aircraft structure and design in detail including a colour section showing a variety of preserved and in-service types. The Australian War Memorial’s example features here and is worthy of inclusion for its method of display with the engine exposed and wings removed allowing a detailed look at the internals if for nothing else. The final three chapters detail the MiG-15 in service and in combat in the hands of China and Korea and later with countries from Egypt to Afghanistan. The chapters on the Korean War are well researched and are a real plus for this book. Increasingly the true nature of Soviet Air Force involvement in support of their fraternal communist partners is becoming known and Gordon has produced an excellent summary of operations by the various VVS regiments which made up the 64th Fighter Corps (IAK) committed to the conflict. I found the recounting of Soviet views of No 77SQNs Meteor F 8s quite interesting. After first identifying the Meteor on gun camera film in August 1951, the MiG pilots soon realised the superiority of their mount. This was such that by the end of 1951 the 64th IAK planned to take out 77SQN in its entirety in a blow aimed at achieving a political effect by imposing an embarrassing defeated on a key ally in the UN Forces. Whilst 77SQN fought on until the end of the Korean War their high losses are indicative of this special attention from the Soviet pilots. Concluding the book are four useful appendices. Whilst three are for dedicated facts and figures fans (serial, production and performance stats), the fourth, “Modelling the MiG-15”, is of direct interest to those who will use the book as a reference for a scale replica. Richard Marmo looks at the history of MiG-15 models from Airfix’s early 1/72 scale effort from the mid-1950’s through to Trumpeters 1/48 and 1/32 MiG-15bis and UTI kits commenting on accuracy and buildability. This volume, coming across my desk so soon after Mushroom Models Publications “Mikojan Gurievitch MiG-15” invites comparison. The MMP book is a modeller’s reference which includes fifty pages of detailed photographs and technical drawings. The Warbird Tech Volume on the other hand has far more detail on the history and employment of the type, with more overall airframe photographs and few of close-up detail. MMP has also employed far more colour, but the value of original photographs of in-service aircraft in the Warbird Tech book far outweigh their inevitable black and white presentation. I would say that the honours are about even for these two books. Both bring different aspects to the subject into print and are to my mind complementary volumes. 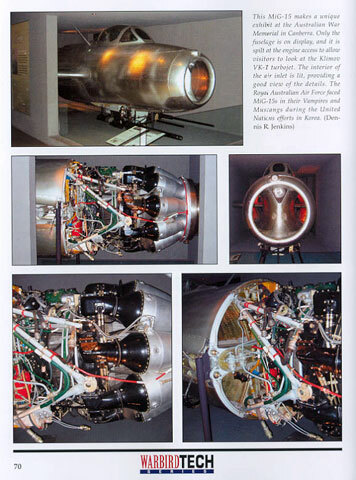 This is the first Warbird Tech volume that I have read and found it to be of very high quality. The book will serve both history buffs and modellers well.